Men, woman and children wore these Southern patriotic rosettes during the Civil War to show support for secession. This beautiful cockade is based on 1860s original cockades. Satin ribbon, reproduction Tennessee military button, hand-sewn onto buckram. Approximately 3" (7.5 cm) across rosette. Pin on back is silver-plated and 1" (2.5 cm) wide. Demonstration in Memphis. According to the Avalanche, the news that South Carolina had withdrawn from the Union, created intense excitement in Memphis on Friday. 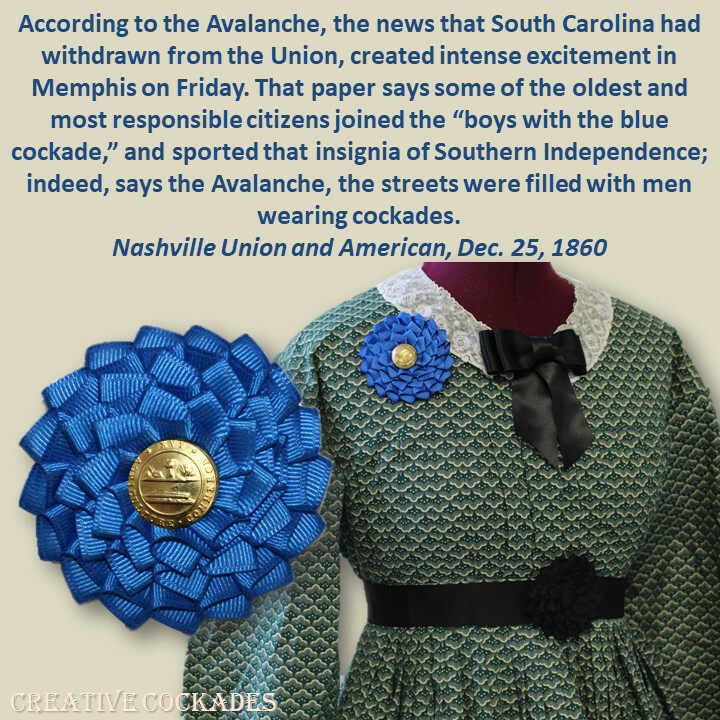 That paper says some of the oldest and most responsible citizens joined the “boys with the blue cockade,” and sported that insignia of Southern Independence; indeed, says the Avalanche, the streets were filled with men wearing cockades. Nashville Union and American, 25 Dec. 1860.